278 pages | 34 B/W Illus. Societies around the world face an increasingly uncertain future as social and ecological changes create pressure on resource governance, and this uncertainty calls for new models that illuminate the intersections of civil society, public sector, and private sector resource management. 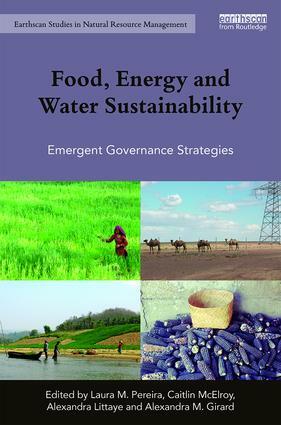 This volume presents a diversity of collaborations between various governance actors in the management of the Food-Energy-Water (FEW) nexus. It analyses the ability of emergent governance structures to cope with the complexity of future challenges across FEW systems. Divided into two sections, chapters in the first half of the book present a collection of case studies from around the world exemplifying how FEW nexus challenges are addressed in a multitude of ways and by a variety of actors. Chapters in the second half offer broader perspectives on the management of FEW and underline the lessons that emerge from applying a FEW lens to the question of natural resource governance. The varied examples in this book highlight that the management of FEW is often a question of reinventing, adapting, and building upon existing practices. Such practices are deeply embedded in unique socio-cultural, environmental, and political contexts as well as ‘hard’ infrastructures. Most of all, this edited volume seeks to communicate the wealth of ideas from committed individuals who continue to work to improve natural resource governance and our sustainable futures. 11. An Ontology of development in the Geopolitical North: Resource extraction in the Canadian Northwest Territories and the shift in indigenous experiences of nature. 13. Out of sight, out of mind? Bringing the governance of mining and water risk into focus. Laura M. Pereira is a post-doctoral research fellow at the University of Cape Town, South Africa and a researcher at the Centre for Complex Systems in Transition, Stellenbosch University, South Africa. Caitlin A. McElroy is a Departmental Research Lecturer at the Smith School for Enterprise and the Environment and the School of Geography and the Environment, University of Oxford, UK. Alexandra Littaye is a researcher at the School of Geography and the Environment, University of Oxford, UK. Alexandra M. Girard is an independent researcher and consultant in environmental management and gender issues based in Sydney, Australia. This series includes a wide range of inter-disciplinary approaches to natural resource management, integrating perspectives from both social and natural sciences. It includes textbooks, research monographs and titles aimed at professionals, NGOs and policy-makers. Authors or editors of potential new titles should contact Hannah Ferguson, Editor (Hannah.Ferguson@tandf.co.uk).